Photo by Wright State Men’s Basketball Twitter. Both the Men’s and Women’s Basketball teams have been in action the past week, with each team playing two games. The women’s team has dominated as of late, winning both of their games. The men’s team is back from their trip to Cancun over Thanksgiving Break and is trying to bounce back from the losses. The women’s team played two games, on Nov. 24 and 25, in Nashville, Tennessee, for the Challenge in Music City event. The first team they faced was Stetson University, who the Raiders dispatched by a score of 57-44. Next on the plate was Marist, who the Raiders beat 76-60 despite being down at half. They now have a record of 4-3. The men’s team played Cedarville University on Nov. 27. The game was much closer than originally expected, with the Division II Cedarville Yellow Jackets being neck and neck, and even leading the Raiders during the first half. Eventually, the Raiders were able to wear down the Yellow Jackets defense and score in the second half, winning the game 58-39. On Dec. 1, the men traveled to Indiana to face Indiana State University. 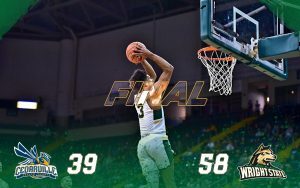 Wright State lost 63-69, making them 4-4 so far this season.